Well, I suppose I need to make at least one New Years resolution for 2011. I won't start posting a multi-part review until it's completely written. This review started for Halloween 2010 is finally wrapping up at the end of the holiday season. I do think I can sneak this one under the wire since it's "little" Christmas, or Ukrainian Christmas Day today. The season has not quite ended for some of us. While the 3rd segment of Tales from the Third Dimension, “Visions of Sugar Plums”, lacks the 1st segment’s cast of Halloween monsters and the 2nd segment’s atmosphere it makes up for it in cartoon antics. 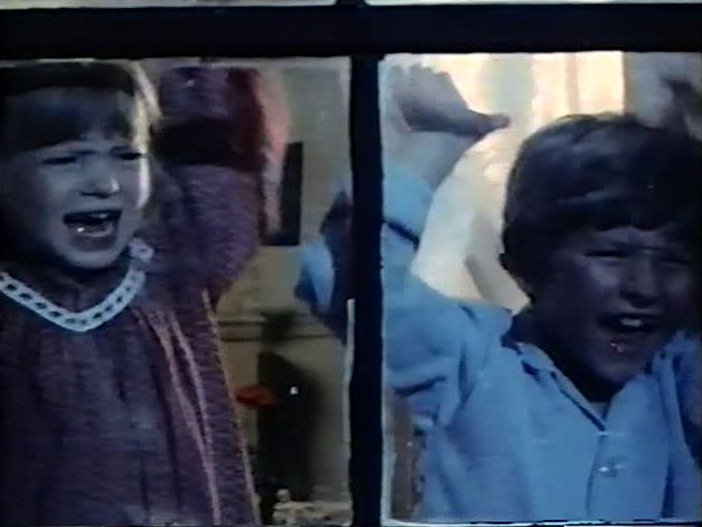 “Visions of Sugar Plums” is a black Christmas comedy told through the viewpoint of its child protagonists. The plot is pretty simple. Mom and Dad, wishing to spend the Holiday Season someplace warm, unload their two children with Grandma so that they can spend Christmas in Hawaii. 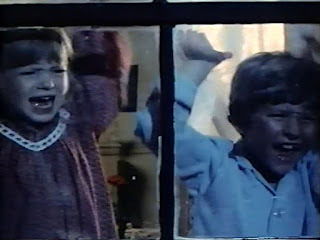 Unfortunately for little Susy and Dennis, their elderly wheelchair bound Granny happens to be off her medication and the strain on her sanity is starting to show. Why any parent would choose to leave their children in the care of an infirmed paraplegic grandparent is beyond all responsible parental decision-making? Of course this only goes to highlight the selfishness of the parents’ actions, both to the children and Grandma, which is the point of this zany short film. The children are left to navigate through an adult world without any guidance. The following bedtime exchange between the two children sums up the film’s tone and humour. SUSY: Remember last Christmas when Dad stayed up all night vomiting. DENNIS: Yah. I can’t wait to grow up. The world of the grown-ups is an absurd world, which only becomes more confusing as Grandma’s sanity degrades. Hoping to be saved from the situation the children call the airline to find out when their parents will be home. It’s Grandma on another phone in the house that informs them that the plane from Hawaii has crashed and everyone is dead. But it’s Christmas Eve when Granny really loses it. 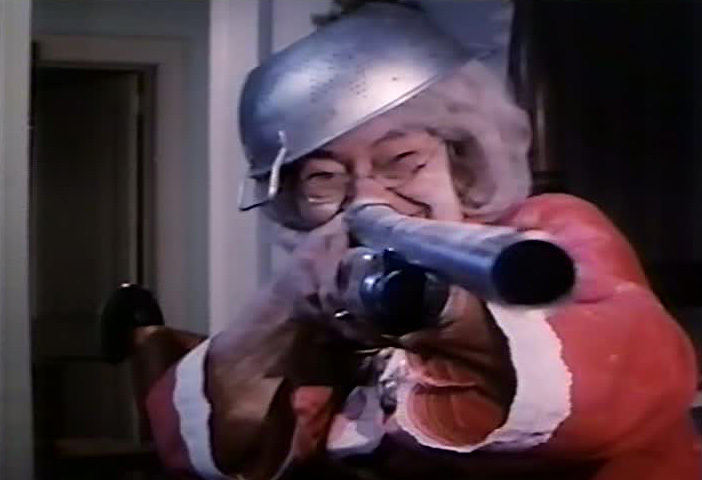 The children’s lives are in mortal danger when Grandma starts packing a shotgun and begins to unload. Thankfully for Susy and Dennis she’s not much of a shot. The children are finally saved from Grandma in a deus ex machina ending, not by their parents, but by the jolly man in red, Santa Claus. Keeping with tone of the film, Santa doesn’t merely show up and make everything right; he disposes of Grandma sending her up the chimney and out into the night sky like a shooting start, another childhood icon darkened by the world of adults. “Visions of Sugar Plums” packs a pretty entertaining punch. Its 3-D effects are more of the thrill ride variety than today’s textural approach (it seems the budget was to small to afford snow at Christmas). 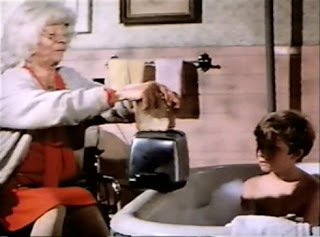 Grandma is given every opportunity to thrust objects at the audience (a shotgun, oatmeal a rolling pin and an electric carving knife). Although the direction straightforward and underwhelming at times (mostly servicing the script), it’s a shame that writer/director Todd Durham didn’t helm more films for Owensby. At the close of Tales from the Third Dimension, Igor promises more tales from the 3rd Dimension. Alas no new installments ever materialized. I personally would look forward to a Tales from the Third Dimension - Part 2 in Digital 3D.